Monica here and I'm back today to share a birthday card with you. 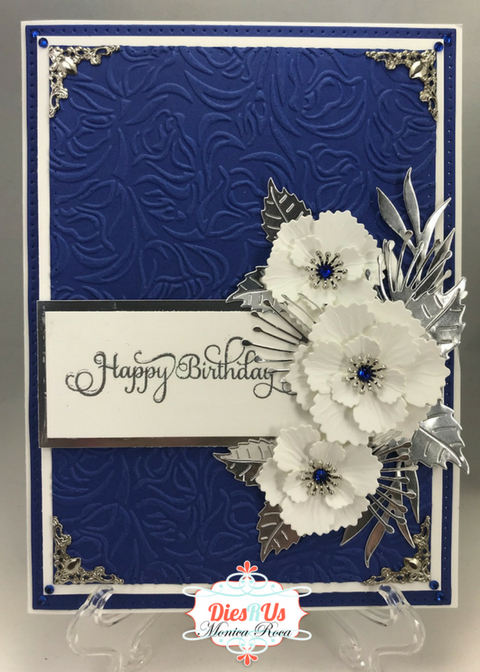 This card was quick to make with just a few beautiful dies found in the store. I have a youtube video which will be below the photo to go over all of the products used and well as the details of the card. Thank you so much for stopping by! Have a great day and happy crafting! Beautiful card, love your flowers and blue color just makes everything pop. I have that die...use it a lot. Love it. Absolutely GORGEOUS Monica! LOVE your choice of color & design! Wonderful inspiration ... thanks! Beautifully designed card; love the dies!